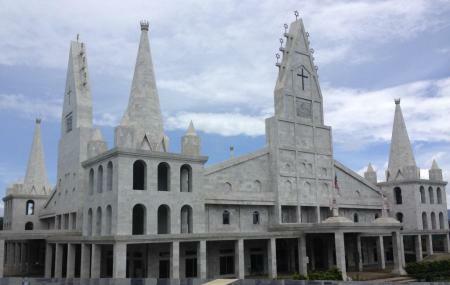 Tucked away in the clouded hills of west Aizawl stands the Solomon’s Temple, an architecturally magnificent white structure that has been attracting curious tourists from around the world. When travelling upon the dusty uneven roads leading up to the temple, one doesn’t expect to come upon a place of worship so structurally magnificent. On a clear day, the temple, made purely of white marble brought in all the way from Rajasthan, can be seen shining against the bright, sunny, azure Aizawl skies. White winged angels perched upon the temple hold trumpets to the heavens. Seven gold stars, a simple Cross and a crown underneath it adorn the facade of the temple. Within its compound, the temple complex has a natural park covered by various forest trees to shade and fruits for bird and squirrel of different kinds meant for their sanctuary. Ramhlun bus stop is the closest to the temple. How popular is Solomon's Temple? People normally club together Mizoram State Museum and Durtlang Hills while planning their visit to Solomon's Temple. People also prefer to start their day with Solomon's Temple. Its a really beautiful place. Its decorated with so many extravagant things and seems like a new world altogether. Nice place to get some photography done and bring your kids too. The temple is huge and really mesmerizing. It's really difficult to explain the beauty in words, especially during the festive season when there is so much decoration. If you are in Aizawl it should be in your visit list. I love love this place. Its a must go for all foreigners. It is really clean, the flowers are beautiful and the decorations. It is the second Solomons Temple in the whole world. So, why not visit huh?? You can snap a lot of pictures there, everywhere is a pictorial site. Not to forget the gatekeeper is very polite and is fluent in Hindi&English. You can talk to him and ask lot of questions even in Hindi. He's a very generate person.